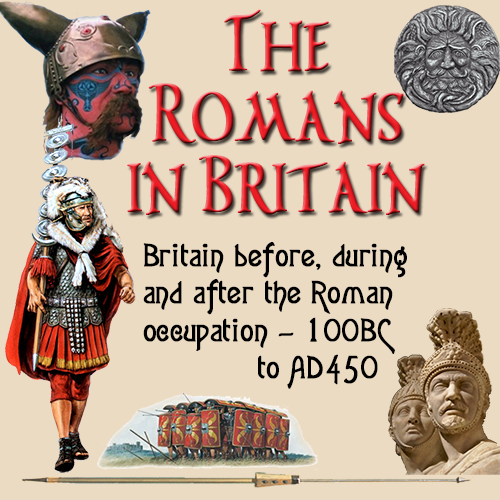 B efore studying the methods of farming in Roman times, we need to look at the Celtic attitude towards agriculture before the Romans arrived, which will give us a basis to understand how the Romans changed the structure of agriculture in Britain. Britain was a nation divided into a series of areas, each ruled by an individual tribe. Although these tribes were living together in the same country, there were personal differences between them—that is, some tribes were friendly towards their neighbours, while others bordered on the edge of war. Each tribe was ruled by a monarch, and had a structure were everyone in the tribe knew their place in the order of superiority. Everyone had their duties and responsibilities. As there was always a strong military presence in every tribe, there were the warriors, their leaders and trainers. In civilian life, there were the administrators, the clergy, the tradespeople, and what were probably the most essential of all: the farmers and farm workers. In any of the tribes, there was just no room for anyone that did not pull their weight and so they evolved methods of discovering where the potential strengths and weaknesses of adolescents lay—this through "trials" and "tests" if you will. 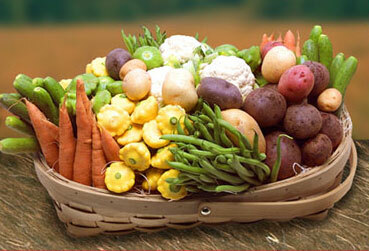 In each farm they had to supply a proportion of the ongoing need for food. Britain was, like the rest of Europe, an agricultural community. Whether it was by growing crops cereals, or raising livestock, they had to supply the whole tribe. In these times, there were no facilities to store vegetables as we have today and there was no way they could sell of any surplus produce. So farmers only grew for the immediate need. The ability to produce more that they consumed was there—it just needed the right people to come in and show them how to market their products outside their own tribes. When the Romans undertook their expeditions in 55 BC and 54 BC, they consumed enormous amounts of grain and farm produce, which Caesar requisitioned by force. 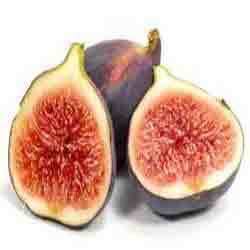 When the army retreated back to Gaul, the idea of selling produce, especially wheat (granum), to the Romans caught on. 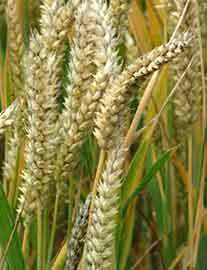 In the first century AD, Stabo list wheat as one of the goods that Britain was now exporting. Indeed Cunobelin placed a symbol of wheat or barley on his coins produced at that time to show that the marketing of cereals was now taking place. When Claudius invaded in 43 AD, the Romans became a substantial consumer of farm produce, especially wheat that they again requisitioned. In many cases, the invasion brought a new-found wealth to some farmers, as they now had a ready-made and secure buyer for their products. To ensure that at least the basic rations for the army where available, the Romans levied a tax known as annona militaris which was paid in kind, in the form of produce, by the farmers. The amount to be paid over was calculated as a percentage of the crop. This did put pressure on the farmers to grow as much as possible, as the Romans took their taxable portion "off the top" before the farmer was allowed to keep any for himself or his tribe. The farmers saw this as an opportunity to sell more of their produce, not only to the military, but also to the people in the new towns that were now springing up in Britain. 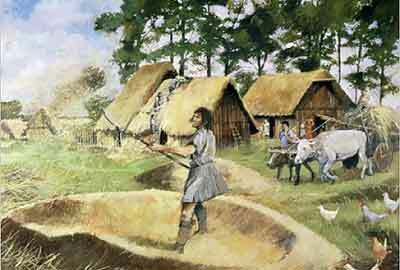 To sumarise, there were three basic factors that changed the British way of farming under the Romans. The new towns needed to be supplied with food from outside their boundaries. The famous Roman road system and the opening up of rivers to traffic made transporting farm produce much easier and enabled the farmers to distribute their wares further afield and bring these crops to market. The currency became stronger, so trade was easier, with small denominations now available, so that even small transactions could take place. 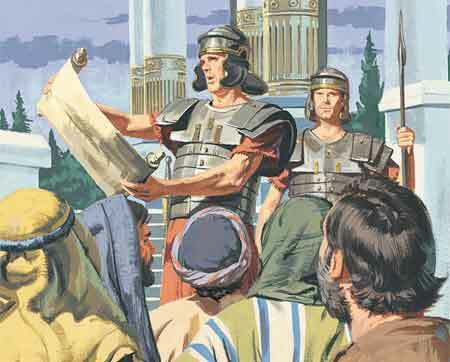 With the building of the new towns, and the increase in size of small settlements to the size of a town, this meant there were more people in a concentrated area, and so less workers for the farms. Also the towns were taking more land and more people meant more demand on the farms. Therefore, as yields per acre did not increase, more unused land had to be given over to farming. This was further complicated by the way in which large towns like Colchester swallowed up surrounding land that could, and was, used for farming. This became a matter of contention and helped fuel the events that led to the Boudiccan rebellion. 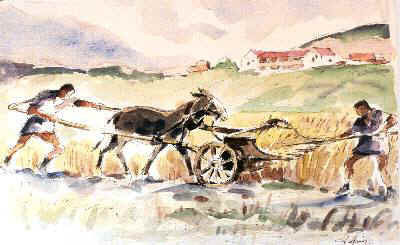 The fields were plowed with an ard-type plow, which is basically a heavy stick pulled by an ox. Later the Romans did add a coulter to the plow, which would help break up the soil before the plowshare would turn the soil over. The situation was eased slightly by the development of better, more efficient tools for working the land. 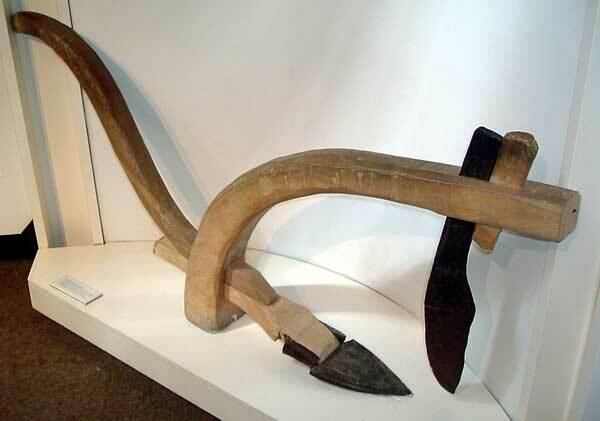 The original Celtic plough, for example, could cut a grove into the soil, but later versions enabled the soil to be cut to a greater depth and also turned to one side. Very few ploughs though, have been found, as they were not discarded or lost, but returned to the blacksmith to have new parts fitted. and when they were beyond repair, they were broken up to make other tools. 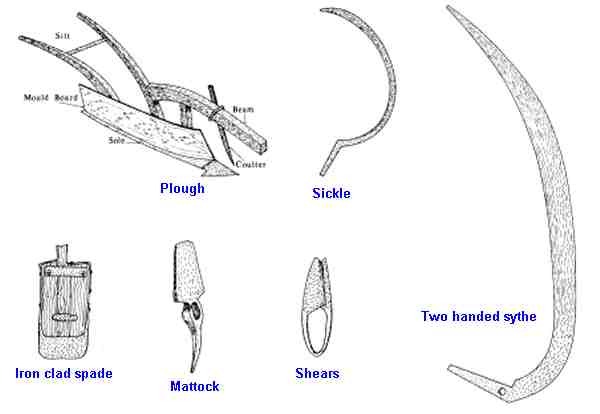 The introduction of two handed scythes made the cutting of the cereal crops faster and easier. Better quality axes and such, meant that more woodland could be cleared faster and thus more easily turned into farmland. It was not just the tools that improved. The Iron Age era brought the introduction of Spelt, a form of wheat that was suited to the damp climate of Britain. This allowed a winter sowing, as well as one in spring, thus increasing the yield. Along with grains such as rye and oats there were the root crops, such as turnips, parsnips and carrots which provided more vegetables—not only for the people, but also for the animals to eat in winter. There was still the problem of storing cereals for the winter—Britain being essentially a damp country, caused the harvested crops to become soggy and thus unusable. These crops had to be "parched" before storage, and this was achieved by building huge ovens that the corn could be dried in. The ovens were built of brick and stone, with a furnace outside delivering hot air under the floor and out through a flue. The grain would have been spread out on an upper floor and allowed to dry by the action of the conducted heat from below. The livestock was also improved by careful breeding and this, along with better supplies of winter fodder, made for a better quality breed of cows, sheep and pigs, which in-turn, made for better quality dairy and meat produce. Hens, geese etc. benefited from improved conditions and better feeding during the winter, which helped them to produce more and richer eggs. In the Roman world, nothing was wasted and even the feathers of the fowl were put to good use. Pigs were fatter and meatier and all around, the British peoples enjoyed a diet that ensured everyone had a good standard of nutrition and plenty of it. Good timber was abundant and the improved tools and transport system that the Romans brought, made the felling and moving of timber much easier, thereby making it a valuable crop. The Romans had a code of pricing referred to as the Diocletianic code, where a 25 ft. (23m) tall, 2 ft (60 cm) fir tree could fetch 50,000 denarii. To earn the same amount in the sale of wheat, a farmer would have to sell the crop from a field of 5 hectares in size. This was something of a short-sighted method of making an income though, as the landowner would get an initial income from the sale of the wood, but would then have to wait for the trees to regenerate before more could be sold. It is believed that in Celtic times, the practice of crop rotation was practiced, wherein the farmer could have four fields and keep one empty per year. Leaviong a field empty or "fallow" would help the soil to get back the nutrients that had been taken out during the crop growing years. This was certainly the case in Roman times. Even so, in the fallow years, the fields would not have been left unattended, as the animals were encouraged to graze off the stubble and weeds that inevitably grew and, at the same time, fertilized the soil with their excrement. This, along with the manure collected from the farmyard, meant the fields had the necessary minerals and chemicals regenerated over a period of time—a "win-win" as it is now called. The size of fields too, was set at a standard which was determined by the amount area that one man could plough in a day.